There’s some seriously bad news for anyone reliant upon Patreon donations. Patreon has long served as a creative alternative to traditional crowd-sourcing platforms. It’s also offered a welcomed change from YouTube’s bottom-scraping revenues. The way it works is simple. In lieu of flat donations for an individual project, creators on Patreon receive smaller, recurring payments from their loyal followers. It’s a model that’s more sustainable for creators and gives them significantly more flexibility to pursue their passions. It also allows artists to adapt to creative and practical whims rather than being tethered to specified benchmarks and features. Patreon has grown to become one of the preeminent crowdsourcing platforms in just four years, but a convergence of issues with the platform is causing many subscribers to become angry with the company. 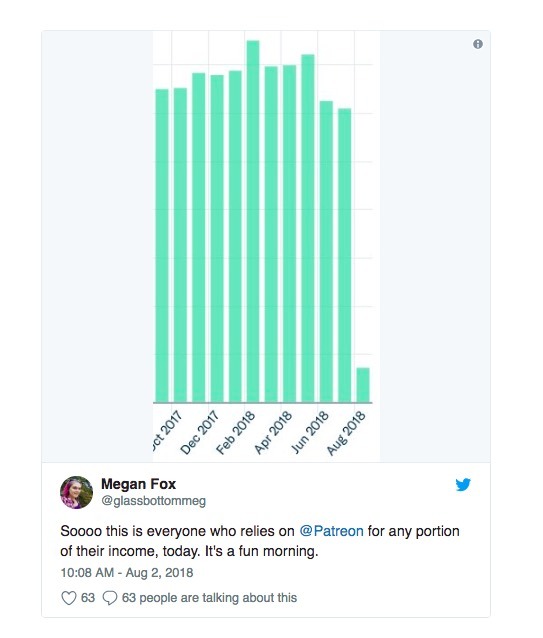 As of August 1st, an inordinate number of Patreon users are seeing their payments being unexpectedly declined. Given how many of these creators rely on Patreon to make a living, it’s a worrying development. Two issues seem to be responsible for the sudden decline in payments: changes to the company’s internal policies and banking problems. While occasional declines in payments are expected with this model, some creators have seen as much as a 50% drop in the money they’ve received for the month of July. Many of the payments in question are being incorrectly flagged as fraudulent. And while the exact reasoning behind these issues is still ambiguous, speculations have run wild. The most prevalent theory is that a move by Patreon from U.S. to U.K. banking servers is to blame for these discrepancies.